Opportunity knocks: amazing TOP FLOOR, CORNER UNIT in an ELEVATOR BUILDING with THREE PARKING SPACES at luxurious Spicket Commons. Renovated in 2008, this gorgeous unit offers 2 Bedrooms, 2 Full Baths, 1,145 SqFt of living space, soaring 9 ft ceilings, hardwood-like laminate flooring, master suite with private bath, and walk-in closet. Water heater replaced in 2010, and central cooling condenser replaced 2015. The kitchen features a breakfast peninsula and custom tile backsplash. There is a second bedroom and full bath. Washer & Dryer in the unit are included. 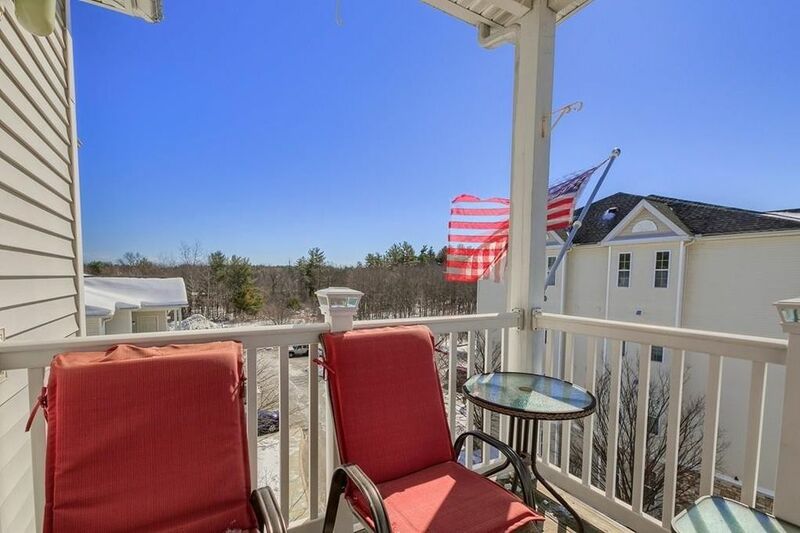 Enjoy the southern sun from your covered deck. Parking spaces 187, 188 & 189 are adjacent, and located in front on the building's main entrance, and can been seen from your deck. Grounds are professionally maintained and include a heated swimming pool, clubhouse with kitchen, business & fitness centers. Enjoy the convenience of shopping and restaurants in tax-free Salem, NH, and Interstates 93 & 495. Pet friendly! Directions: Cross Street or Broadway (Route 28) to Hampshire Road. Look for Spicket Commons sign.